Flip. Bend. Set. And get comfy. Set your iPad at any angle within 50 degrees or perfectly flat—to create a comfortable viewing angle no matter what you do. The powerful hidden hinge keeps your iPad at the exact angle you set until YOU adjust it again. 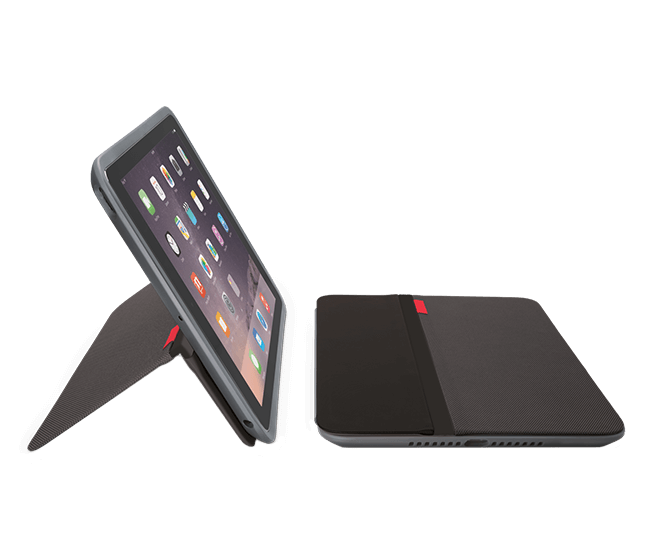 Hidden magnets keep the stand secure so you can pick up and move your iPad without disrupting your viewing angle. AnyAngle™ is designed to take on bumps, resist scratches and weather spills all thanks to the Logitech Essential Protection System. AnyAngle fits every style too. With six color combinations, it’s easy to find the perfect match. Life is full of angles. Take them on with the case that covers them all. Auto wake/sleep feature wakes iPad when you open the cover and puts it to sleep when you close it.